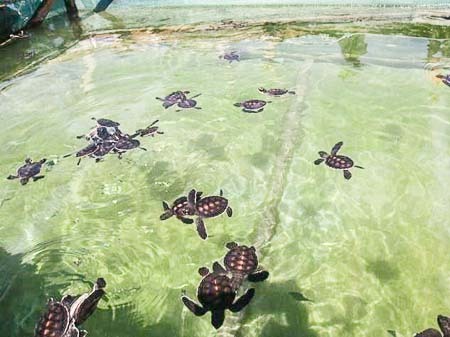 [W]e currently have two Olive Ridley rescue turtles at our Kuda Huraa facility. Elsa – arrived in July from Bandos and is showing significant health improvements. She is able to swim and dive down, but without her two front flippers she has a very slim chance of surviving in the wild. We are trying to find turtle facilities overseas that might be willing to give Elsa a permanent home. 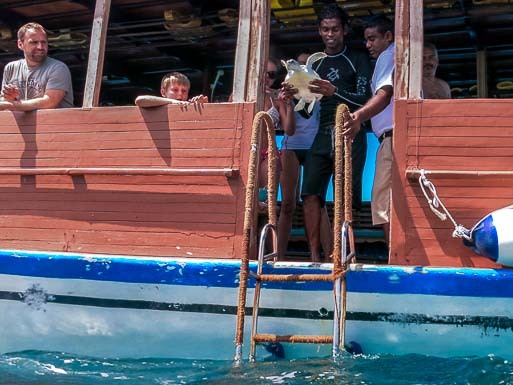 Casey – arrived on 26 October from Taj Exotica Resort (S.Malé atoll). The turtle was entangled in a cement bag (pictured) and her front right flipper was badly damaged. She will stay with us to be fed a healthy diet and be closely monitored until she regains strength in her left flipper and is able to swim properly. So we now currently have 22 turtles in our rearing facilities – two Hawksbills and twenty Greens. 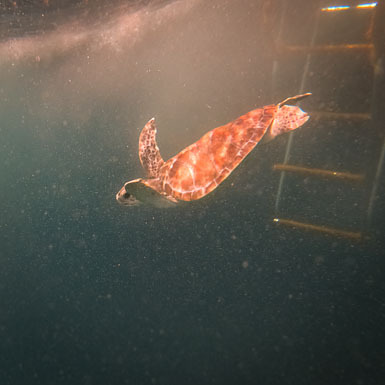 And on 23 October, some of our guests were joined on their snorkelling safari by ‘Tzav’ – one of our green turtles who had grown large enough to graduate from our ‘Head Start’ programme. He was released from our safari dhoni back into the open ocean. Bon voyage, Tzav! [W]ord of our nest protection project is spreading and this month we were contacted by local military personnel from Feydhoo Finolhu (N.Malé atoll). They had found a turtle nest on their training island and had been protecting it until the hatchlings emerged from the sand. 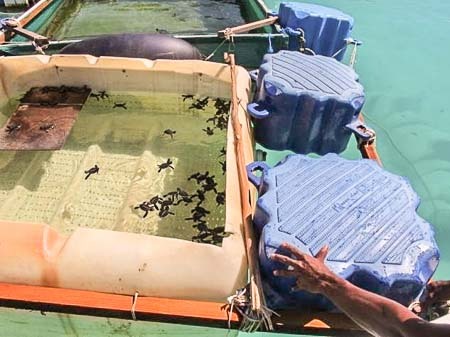 Akram, our turtle biologist, visited their rearing facilities to offer some expert advice on how best to feed and care for the 102 hatchlings. 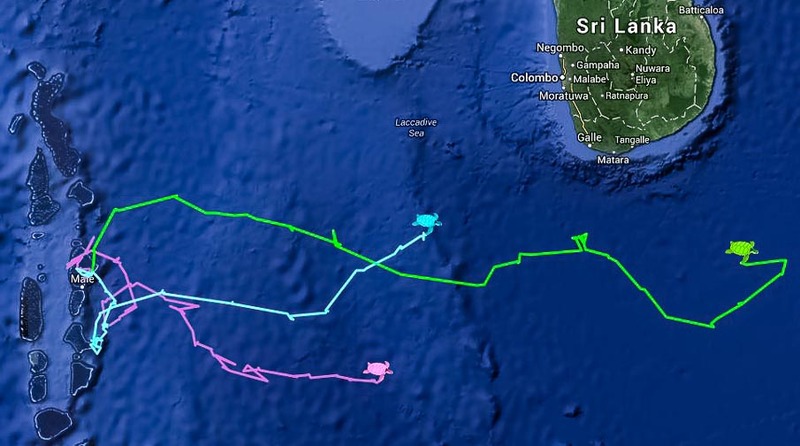 [O]ur three hand-reared turtles – Bailey, Alfred & Maluo – are making rapid progress since their release, swimming towards Sri Lanka and beyond ! 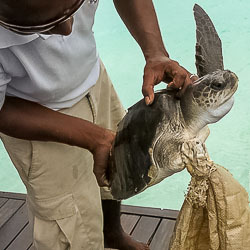 Check out their latest movements on our interactive satellite tracking maps, and read more about their release here – Kuda Huraa-born Turtles Released Back to the Wild.